We want life to be like an equation – something that we can always figure out and make sense of. We often have this expectation that if I live with wisdom and in obedience to God, then my life will go well. We might even accept this as a rule. I want to talk tonight about how Ecclesiastes presents us with some exceptions to the rule. Proverbs tells us that in general if you live a wise life and obey God, things will go well for you. But Ecclesiastes points out that there are exceptions. Life in this world doesn’t always add up. Life in this world doesn’t always make sense. Big Idea: Life in this world doesn’t always make sense. There are things in the passage we read that should shock us. There are things we read that we don’t expect to find in the Bible. Can you say that? Are you allowed to be in here? That is how we should feel when we read Solomon’s words. Wisdom doesn’t always produce the results that we want. People are often treated unfairly in this life. There is an appropriate hatred for this life. Hope: God judges everything AND he treats me like I don’t deserve. And yet our sense of justice is almost always skewed. We love to see other people receive bad when we feel like they deserve it. If someone cuts someone else off on the road… it feels good to see them get cut off. If someone cuts in front of the line, it feels good to have someone intervene and send them to the back of the line. If someone makes fun of you, it feels good to see them get torn down. And on the flip side, we balk when we feel like we don’t get something good that we deserve. If an older brother or sister received a phone when they were 12 years old, but you were told you would have to wait until you were 16, you would flip out. If your friends are all invited to a party, but you aren’t invited, you sulk, get angry, and plot how to get back at the person who did the inviting. If I gave half of you candy, the other half of you would balk at the fact that you did not also receive any candy. We have this intrinsic sense that is quick to be happy when bad things happen to people that “deserve” them, while also feeling that we only deserve good things and get upset when we don’t get them. The cross teaches us that we actually deserve that bad that we so often reserve for “other” people and yet we receive good that we don’t deserve because Jesus took on the bad that we deserve. Big Idea: Jesus got what we deserved so we get what we don’t deserve. On the cross, Jesus gets what he doesn’t deserve. On the cross, Jesus gets what we do deserve. Because of the cross, we get what we don’t deserve. How Can We Do Justice? The Bible is not a how-to manual on life. It’s a story the Story of God creating, man rebelling, God saving, and ultimately God restoring everything. So with that in mind – I don’t want you to think that tonight is simply a how-to lesson. It fits into the broader context of the Story. Part of God saving and restoring everything is that he works through Christians to spread the message of salvation and to bring about restoration in a broken world, OR in other words to bring JUSTICE in this world. Justice is punishing wrongdoing/speaking up. 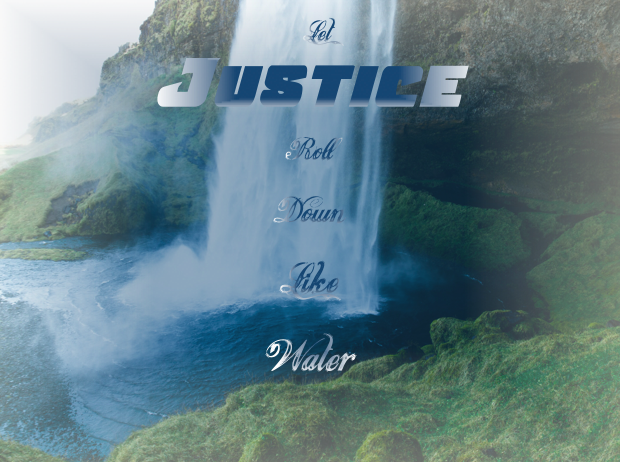 Justice is caring for those who are weak and marginalized – the outcast. Justice is meeting people’s needs. Justice is loving your neighbor – ALL of them. We should do justice because God has created all people alike and has worked to saves us while we were poor, weak, and outcast. Tonight is really going to have 5 basic points. Some of it is review, some of it is new. This is not a set in stone way of this is how you must do justice!! This is suggestion for how we can go about starting to care about justice in our world. We are going to look at a passage out Acts. This passage tells us about one of the first problems that arose in the earlier church and it shows us how the disciples responded. This passage gives us some basic principles for how we can go about doing justice. Big Idea: Start doing justice where you are at. Why Should We Do Justice? I have done some stupid things myself because of dares… ranging from eating dog food to randomly going up to a girl and asking for her phone number (which I did not receive). Why would anyone ever do any dare? It always involves something uncomfortable, or painful, or challenging. So Why do it? Maybe it’s for recognition, maybe it’s for excitement, maybe its for money… there’s always some reason behind WHY we would accept a dare. If my mom dared me to eat dog food or ask for a girl’s number in 7th grade, I probably would’ve said “No Way! That’s ridiculous.” But as soon as a peer asks me, it’s a different story. Then all the sudden I feel an obligation to accomplish the dare. It provides a different motivation for me to accomplish that dare. Motivation (the WHY question behind what we do or don’t do) effects what we do and how we do it. Big Idea: We should do justice because God has created and saved us. Introduction: Refresh from last week. Reintroduce Series. We talked a little bit last week about how justice involves love for other people. But we want to key in on this more closely this week. Last week we talked a little more about big picture justice. This week we want to narrow it down to a more personal level. Last week we went hiking through the woods of Justice. This week we’re going to camp out at the center of what it means to do justice. Big Idea: Doing justice means loving your neighbor. To talk about this we are going to look at the parable of the Good Samaritan. In this whole chapter God speaking through Amos and telling Israel why he is sending them into Exile (Quick History Lesson – Israel was split up into two parts at this point – Israel, which was the north part of Modern-Day Israel and Judah which is the southern part of Modern-Day Israel. Assyria invaded and captured Israel and took the people into Exile – several hundred years later Babylon, the next power after Assyria, invaded Judah and took the people of Judah into Exile as well). Amos says that they appear to be religious – they keep the feasts that God has commanded of them, they bring plenty of sacrifices, and they sign songs and make melodies to God with instruments, but God says he HATES these things. Why? Not because these are bad things for Israel, God has commanded them. But, because Israel practices outward religion towards God and yet they are unjust to their fellow humans. Like if your ordered a hamburger at a Restaurant and they brought you out a perfect pun, with toppings stacked in the middle, but no burger. You would rightfully be upset – the burger is crucial – no matter how good the other parts of the sandwich look. Israel has obeyed certain parts of God’s law, but failed to obey other parts of God’s law. Israel has tried to show that they have a relationship with God. They have read their Bibles, gone to church, given money to the church, and song worship songs to God. (Now we realize that none of this stuff has the power to make us right with God, but only faith). But they have failed in relationship with other people (horizontal relationship). They have not show justice to fellow humans. When Jesus asked someone what is written in the law, he rightly summarized it as “Love God and Love your neighbor (Luke 10:27).